Hair breakage is a major challenge many young ladies face. The hair at times pulls out on its own even without combing it. Some ladies also find their hair length reducing drastically even at a tender age, this serves as a concern to many people. Diet also plays a very important role in determining whether you will have a good hair growth or you will suffer from hair breakage. Good Nutrition is paramount, hair too needs proper nutrition including vitamins, minerals, protein, etc., just like your other parts of body. Ensure your diet has the necessary ingredients to promote healthy and strong hair that will not break easily. This is a very good tip to prevent hair breakage. Hair is in its weakest state when wet. Moreover, when you comb wet hair, more strands of hair will pull out. Avoid combing your hair when it is wet. 3. Stop the use of chemicals on your hair. Some hair care products have excess chemicals in them which will cause hair breakage rather than to enhance good hair growth. Avoid using hair products containing harsh chemicals on your hair. Look out for herbal or organic hair products or those containing less of harmful chemicals. Have good hair hygiene, your hair should not be left unkempt. Mistakes in your hair care routine are often the foremost reason for your hair breakage. 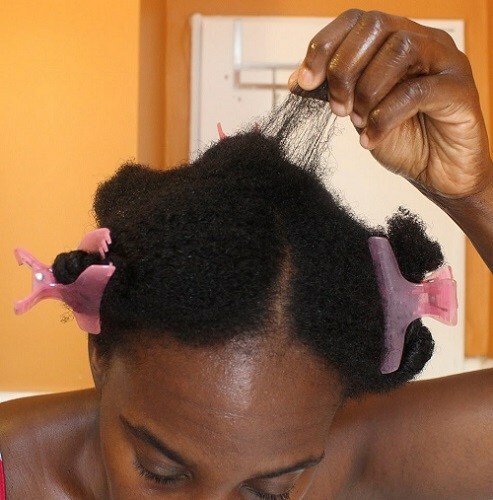 Moisturize your hair; this is also an essential way of stopping hair breakage. Going weeks without deep conditioning or drinking enough water will rob your hair of moisture. Well-moisturized hair is less prone to dryness and breakage. Dryness will give way to breakage, delicate hair strands will break off easily with the slightest form of manipulation. 6. Avoid too much Washing of your Hair. Do not wash your hair too often. Eggs, when combined with other products can be used to treat both breaking and damaged hair. It is also a source of lecithin and proteins which can repair hair damages and improve its texture. The above steps among others are ways by which you can reduce hair breakage and enhance a good hair growth.